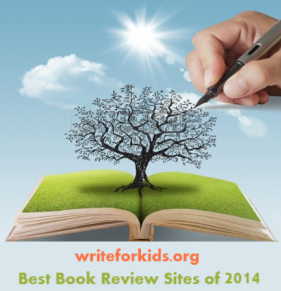 Upon request, the publisher sent me a copy of this book for review. Brown and Lopez (Pura Belpre Honor winner My Name in Celia: the life of Celia Cruz Me llamo Celia: la vida de Celia Cruz) have again created a wonderful tribute to a famous Latin American. In this colorful, and very festive bilingual picture book biography readers will learn about the man considered the ‘Godfather of Salsa” and the “King of the Mambo” -- Tito Puente. ¡Tum Tica! ¡Tac Tic! ¡Tum Tic! ¡Tom Tom! During World War II, Tito was in the Navy. He joined the ship’s band and learned to play the saxaphone and write music. After the war, Title went to the Juilliard School of Music and dreamed of having his own band. And, he did have his own band—The Tito Puente Orchestra and he made music with Celia Cruz, Santana, and La Lupe. Lopez uses bold colors to create large, double-page paintings. In every one we see the hyperactive Tito constantly in motion. Whether he was playing stickball, blowing on the saxophone off the bow of the ship while in the Navy or banging his timbales in his orchestra, Tito was a man in perpetual motion. The book dares readers to sit still. But you just can’t! A must for any collection. 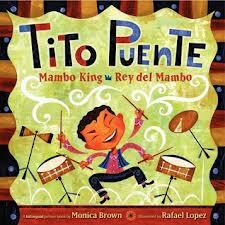 Watch the bilingual book trailer for Tito Puente. For more information on Tito, listen to Jazz Profiles on NPR.